In a hospital setting where your care providers are actively managing your labor, once you have one intervention it makes more interventions more likley to be needed in order to remedy the effects of the previous ones. You go to your hospital in labor and you are hooked up to a continuous electronic fetal monitor so that they may know when the baby is in distress. Having this monitor on means you are nearly confined to the bed, so that the monitor can have an accurate read of your contractions and the baby's heart rate. 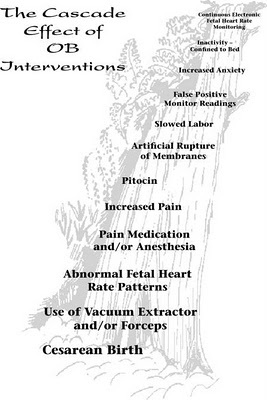 Inactivity slows your labor and you are not dilating quickly "enough," so the nurses give you pitocin through an IV. Pitocin, aka synthetic oxytocin, makes your contractions much too intense and you are in pain. You now ask for narcotics and/or analgesia, like an epidural. The epidural gives you a fever, so the nurses administer antibiotics. It also slows your labor down again and so the doctor artificially ruptures the membranes of your amniotic sac. Now your baby has abnormal fetal heart rate patterns, which may or may not be accurate. When you are encouraged to push, you can't push effectively because you are numb from the epidural. 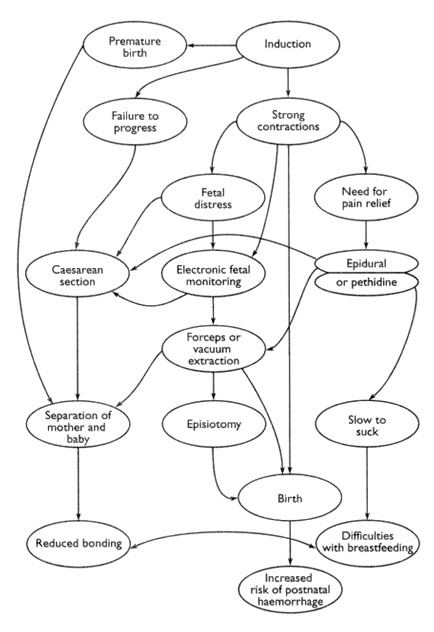 The doctor either cuts an episiotomy and uses a vacuum to get the baby out, or orders a Cesarean section. Cesarean section means baby will have respiratory and other problems and will be most likely taken to the NICU. Mother and baby are separated, which reduces bonding and leads to difficulties in breastfeeding. Separation also means that babies have reduced glucose levels because they are not being fed by mom nor being kept warm by mom, so the nursing staff give baby some formula. The c-section and being fed formula instead of colostrum means baby has a reduction in immune protections. Mother now has to stay in the hospital longer, with lasting abdominal and scar pain, reduced future fertility and the possibility that they can only have a cesarean section if they want another child. Obstetrical interventions can be life-savers for mothers and babies. They are not, however, needed for low-risk mothers where the mother and the baby are both fine and healthy. Wow. This is a huge list of inaccurate assuptions. On what planet do c/s babies immediately go to the NICU and have breathing problems?!?! Artificially rupturing membranes does not cause irregularities in fetal heart rate. Why are you attempting to scare pregnant women out of an epidural? Your birth experience is you decision. I am a high risk Labor nurse and I have seen plenty of medicated and non medicated deliveries, inductions and mom's coming in in labor. EVERY births different and this cascade is ludicrous and inaccurate.